While cleaning out your closet, you find a pair of long-forgotten jeans in a dark corner. Boxes of heavy objects and piles of clothes have pinned the jeans in place for months, and now they seem to be wrinkled beyond repair. Though these wrinkles seem permanent, they can be ironed out with relative ease. Hemline creases, also considered permanent, can also be removed from denim jeans using the steps in this article. Fill a plastic spray bottle with water and mist the wrinkled areas of your jeans. The denim should be damp to the touch once you finish. Place the jeans in your dryer for 10 to 15 minutes on light heat or a touch-up cycle. Remove the jeans from the dryer and place them on your ironing board. Sprinkle white vinegar over any remaining wrinkles, or on the hemline crease if you are attempting to flatten that. Set your iron to its medium heat or "Cotton" setting. Press the iron on the wrinkled area, or on the hemline crease, and move it slowly across the denim. 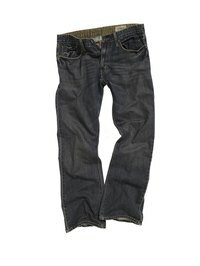 Once the outside of the jeans appears flat and smooth, set the iron aside and turn the pants inside out. Iron smooth any wrinkles on the inside of the jeans. Reverse the pants and inspect them for wrinkles. Hang the pants from a pants hanger or fold them carefully before storing them in your closet. Avoid harsh wrinkling by hanging or folding your pants prior to storage.